It’s officially summer now! I know summer starts on Memorial Day, but Friday was the first day of summer according to the sun. Last summer, I had a list of ideas of things to do while the kids were home from school. Camp starts tomorrow, but when it ends in 4 weeks we are going to need ideas to keep busy with! For now, I thought I’d share Gabbie’s summer goal list that she made at the end of school. My English reading goal for the summer: I want to read one chapter book per week (in the pool most of the time in Florida). My Hebrew goal for the summer: I want to teach my brother Brachos. My science goal for the summer: I want to learn more science with head counselor Chana (ooh ahh). My social studies goal: In Epcot I will have a book that when I stop at different places I get a stamp in the book and I will learn (better show you). My goal as a family member: I want to always make sure my brothers are happy. Isn’t she sweet? 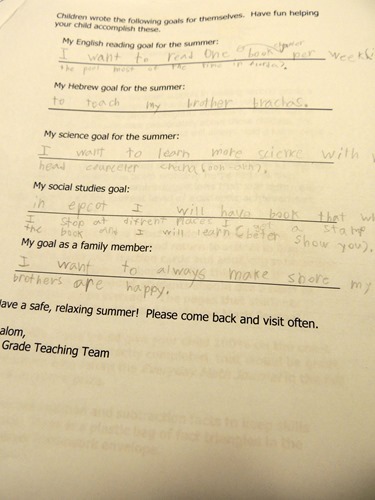 I hope she actually gets through her summer homework – and Zachary too for that matter!